There are those who find the industrial style cold or something soulless. There are others who, like me, love it. Using the right elements does not have to stop being a cozy decoration, and to see if it ends up liking you, we have prepared a series of ideas to decorate your bedroom in this way. You will see what rooms so beautiful and with so much personality, you can design. You dare? 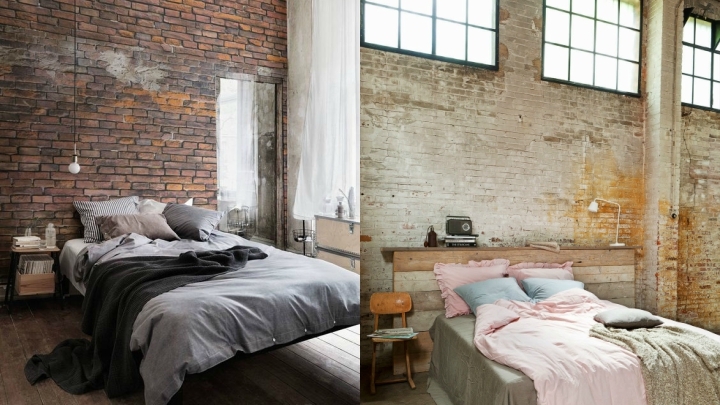 Another idea to get this industrial touch in your bedroom is to leave the brick walls in sight. It can be in one or all. And it is not necessary, once again, to be perfect, since following the first proposal we have seen, it can be irregular and not have a very worked finish, with the stains or flaws that we mentioned before. To make it a cozy stay you can play with the decorative elements and with the textiles. For example, the bed places a fluffy comforter with large cushions or a rug on the floor. You can also put pictures; I love how they are leaning on the floor instead of hanging on the wall, and in this style much more. Chests, antique suitcases, a retro radio or even metal barrels like the ones we would find in a factory. All this will bring personality and warmth to the room. The large windows are wonderful in these rooms, which as they usually use somewhat cool colors need some light to not stay too dark. It complements the natural light with lamps of industrial style, type flexo, metallic, as much of ceiling as in the tables. Do not hide structural elements such as cables, pipes or concrete from walls and floors. 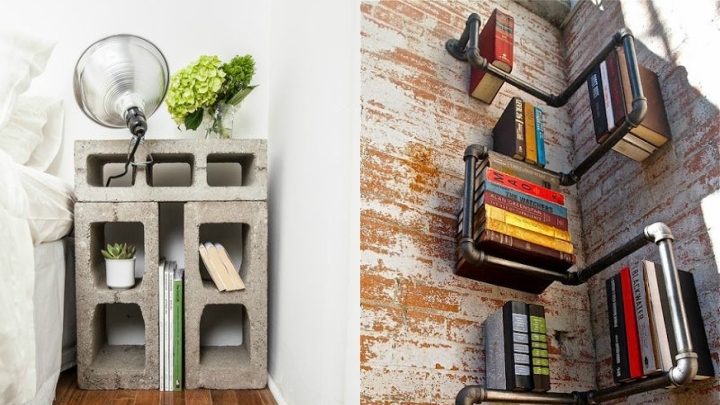 Although you can also play with them and give them extra use, for example, by creating an original bedside table with concrete blocks or a shelf to store your books in the pipes. Besides decorative, they will be very functional. If it still looks like a cool decoration, you can introduce a touch of wood. Of course, it will have to be natural and without just trying. You can create an auxiliary furniture with pallets, for example, that will combine very well with the metallic structures of the rest of the bedroom. 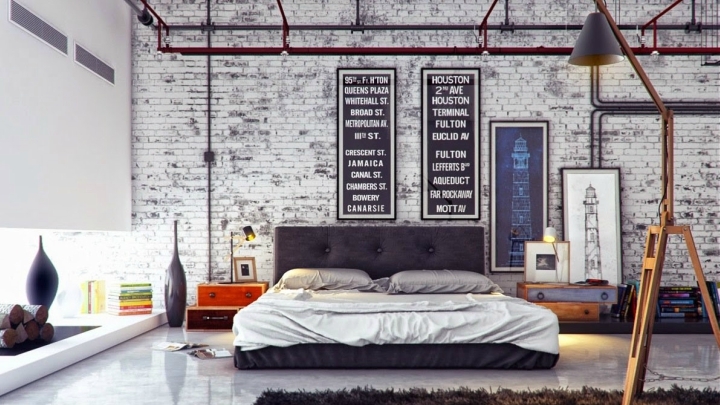 Another idea that I love to decorate the bedroom with industrial style is to place the bed directly on the floor, without a bed base, or with a low bedstead, without legs. This conveys an image of the most beautiful, as the mattress has remained there without much thought, as it has appeared in that factory and we have placed it on the ground to rest awhile.